Slovakia was the only Axis-Allied Nation to take part in the Campaign against Poland. Although the Slovakian military was only six months old, it formed a small mobile combat group consisting of a number of infantry and artillery battalions. Two combat groups were created for use along side the Germans. 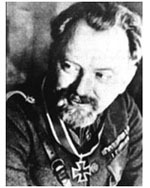 The first group, a brigade sized formation, consisted of six infantry battalions, two artillery battalions, and a company of combat engineers commanded by Anton Pulanich. The second group, a mobile formation, consisted of two battalions of combined cavalry and motorcycle recon troops, and nine motorized artillery batteries, commanded by Gustav Malar. The two groups were organized around the HQ of the 1st and 3rd Slovakian Infantry Divisions. The two combat groups saw fighting while pushing through the Nowy Sacz and Dukeilska Mountain Passes, advancing towards Debica and Tarnow in the region of southern Poland. Four days after the German invasion of the Soviet Union, Slovakia sent its own units forward against the Russian lines. The Slovak Army Group was commanded by the Slovak Minister of Defense, Ferdinand Catlos. The Slovak forces began to fall behind the massive German sweep across the Soviet Union because of a lack of transport for the 45,000 stong Slovak Army Group. Due to the inability of the Slovak Army Group to keep up with the German advance a mobile unit was created. All the mototized units of the former Slovak Army Group were grouped into a single formation, the Slovak Mobile Command, or Brigade Pilfousek. It was commanded by the former commander of the 2nd Slovak Division, Rudolf Pilfousek. 1st and 2nd Anti-Tank Co. Brigade Pilfousek advanced through Lvov and towards Vinnitsa. Around July 8th, 1941, the Brigade had advanced beyond the tactical control of the Slovak command, so control of the unit was handed over to the German 17.Armee. The remaining forces of the former Slovak Army Group (no longer an independent formation), were used in conjunction with the 103rd Rear Area Command of Army Group South for security duties and helping to eliminate pockets of Soviet resistance. In the begining of August, 1941, the Slovak Army Group was pulled out of the lines when it was decided to form two new units that would be better suited to the actions they would be taking part in. The best units of the former Slovak Army Group were now organized into two new divisions, the 1st Slovak (Mobile) Infantry Division and the 2nd Slovak (Security) Infantry Division. The 1st Slovak (Mobile) Infantry Division was also known as the Slovak Fast Division. 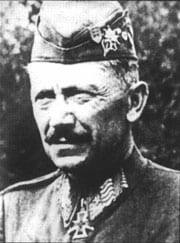 The Slovak Fast Division was originally commanded by Gustav Malar, one of the original commanders from the Slovak advance into Poland back in 1939. By the middle of September, 1941, the 1st Slovak (Mobile) Division was back in the front lines, this time near Kiev. After the fighting near Kiev ended with its final capture, the Slovak Mobile Division was transfered to the reserves of Army Group South. Here the unit moved along the Dnieper River, through Gorodishche, Kremenchug, and Magdalinowka, where heavy fighting took place. As of October 2nd, the Mobile Division was a part of the 1.Panzer-Armee fighting on the eastern side of Dnieper River near the region of Golubowka and Pereshchino. The Mobile Division was then moved on to the areas of Maripol and Taganrog, after which it spend the Winter of 1941-42 along positions on the Mius River. Later, the Mobile Division took part in the German advance into the Caucasus Region where it played a vital role in the assault and capture of the vital Soviet city of Rostov. Late in the Summer of 1942, the Divisional commander became Jozef Turanec. He led the Mobile Division across the Kuban River all the way to the region of Taupze. In late 1942, the 31st Artillery Regiment from the 2nd (Security) Infantry Division was transfered to the 1st Mobile Division. Command of the Mobile Division changed again in January, 1943, when Lt.Gen Jurech took over command. After the horrible loss at Stalingrad in the Winter of 1942/1943, the entire position of the Germans in the Caucasus region was altered, as now any futher advance south would only insure the complete loss of all forces south of the Mius River if and when the Soviets reached Rostov in the North, thus trapping them. As direct result of the losses in the north, the forces in the Caucasus region were quickly pulled back north to escape possible entrapment. The 1st Slovak (Mobile) Infantry Division, as a part of the German forces fighting in the Caucasus region, was pulled back. The Mobile Division was nearly encircled and trapped near Saratowskaya, but managed to escape. The remaining portions of the Mobile Division were then airlifted out of the Kuban, but in so doing were forced to leave behind all their heavy equipment and weapons. The Mobile Division was then used to help cover the retreat of over the Sivash and Perkop land bridges. From here, the Divisions history becomes unsure for the next few weeks, as a specific record of its operations could not be located for this section. What is known though is that it later ended up being commanded once again by a new commanding officer, Elmir Lendvay. It looks as if the Division was pulled from the lines for a short while, until it was again thrown into action, this time near the area of Melitopol. Soon after, the Division was caught by a massive Soviet suprise attack that had managed to break through the German lines. The Mobile Division was routed and over 2000 men were taken by the Soviets. The Mobile Division, routed and destroyed, was then pulled from the lines. A hollow shell of the former Mobile Division was created in the early part of 1944. It consisted of II/20 Inf.Reg., III/20 Inf.Reg., a few 150mm howitzers from the I/11 Art.Bn., some 37mm anti-tank guns, the 9th and 13th light Flak Companies, and the 45 Construction Company. The new formation was dubbed the Tartarko Combat Group, and it containted 12 officers, 13 NCOs, and 775 men. It was sent back to the region of the Crimea for defensive operations, while the remainder of the Mobile Division was used in security operations behind the lines of Army Group South. Finally, in June of 1944, the Division was pulled from the lines a final time and disarmed, being formed into a construction brigade for use in Rumania as a result of its continued unreliability in combat. 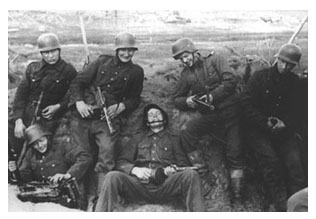 The 2nd Slovak (Security) Infantry Division was used mainly in security and anti-partisan operations in the rear areas of the German lines. Originally, the Security Division was used to clean up pockets of Soviet resistance that the Germans had passed up in the advance eastwards. Later, the Slovak Security Division was used in anti-partisan operations in the region of Zhitomer. A number of the Security Divisions units were removed from its ranks and transfered to the 1st Slovak (Mobile) Infantry Division, including the 31st Artillert Regiment. 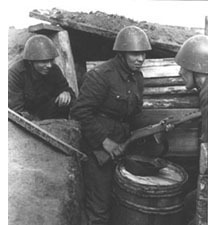 After the defeat at Stalingrad, as the morale of the Slovak troops began to fall, it was moved to the area of Minsk, a much more quiet sector of the front. Soon after, on November 1st, 1943, as a result of continued problems with desertion in the unit, the Security Divsion was heavily disarmed and transfered to Ravenna, Italy to act as a construction brigade. Because of heavy partisan actions against German lines in 1943, the Slovak 12th Engineer Battalion was sent to the rear area of Army Group South. It took part in rail repair operations to fix lines cut by Soviet partisans. It later merged with the 1st Slovak (Mobile) Infantry Division to form a construction brigade in June of 1944.